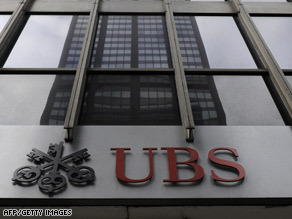 UBS settles secret accounts case with U.S.
Lawyers for the U.S. government and Swiss banking giant UBS AG have told a U.S. federal judge in Miami an agreement has been reached in a case involving secret bank accounts and Swiss banking laws. The agreement was announced Wednesday morning during a telephone conference with Judge Alan Gold that lasted just long enough for lawyers to say that a deal had been “initialed,” but they indicated it would be a few days before the documents were officially signed. No details of the agreement were announced. U.S. Internal Revenue Service Commissioner Doug Shulman issued a statement saying the agreement “protects the United States government’s interests,” and adding, “We will release more details when the Swiss government signs the agreement as early as next week.” The government had been seeking the names of approximately 52,000 U.S. taxpayers that the Internal Revenue Service thinks could be hiding as much as $15 billion in secret UBS bank accounts. Under the agreement it is expected the names of some account holders will be revealed to the U.S. government, but it is not clear how many, and it is also unclear what criteria will be used by the Swiss government to allow UBS to reveal those names. The deal means that a trial in the case can be averted. A Monday hearing for trial preparations has been canceled. UBS, the world’s largest private bank, admitted in February that it helped wealthy U.S. taxpayers hide money in secret accounts. Initially it said it would provided the names and accounts of U.S. customers who allegedly evaded paying taxes on the money. But the Swiss government said banking laws would limit what UBS could reveal. Switzerland has long relied on its strict bank secrecy laws to attract customers from around the world. On July 31, U.S. Secretary of State Hillary Clinton and a senior Swiss official announced an “agreement in principle” on resolving the deadlock, but it has taken nearly two weeks to resolve details of that agreement. The judge had told the parties last week that if no agreement was reached by Wednesday, he would go ahead and set a trial date that could be as early as September.